China Grove- Tarheel Tour veteran Matt Cannon, birdied the second hole of a sudden death playoff to defeat William McGirt and win the Tarheel Tour’s Warrior Open Thursday. Cannon started the day three shots behind McGirt, but a bogey-free round of 64 erased the deficit and forced McGirt to make a curling 12-foot putt on the final hole to force extra holes. McGirt didn’t make it easy however. Cannon birdied seven of his first 14 holes and stood on the 17th tee with a two shot lead at 18-under par for the tournament. 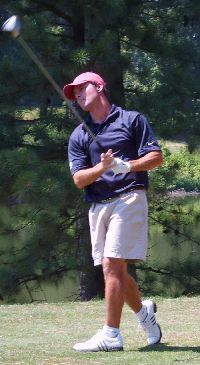 After Cannon pulled his drive left McGirt, the 2007 Tarheel Tour money leader, pasted his tee ball down the middle of the fairway and was left with under 200 yards into the par-5. The subsequent birdie and dramatic putt on the 18th led to the playoff. The players returned to the 18th tee to begin the playoff. Cannon continued his solid play, hitting his drive down the middle of the fairway while McGirt’s drive caught a limb of an overhanging tree and kicked right into the woods. McGirt was able to recover however, and a high cutting iron through the trees left McGirt with a two-putt par putting the pressure back on Cannon after a sub-par wedge and an indifferent chip left him with six feet to continue the playoff. Cannon drilled the six-foot knee-knocker, and finished the playoff with a two-putt birdie one hole later. Cannon’s victory was worth $15,000 and moved him up to third on the current money list behind McGirt and Tommy “Two Gloves” Gainey. “Gloves” began the day only one shot behind McGirt, but bogeys on two of his first three holes left too much ground between himself and the leaders. Despite an eagle-birdie finish the former “Big Break” champion had to settle for a solo third place finish this week. The Tarheel Tour would like to thank Warrior Golf Club head professional Brian Lee and his staff for once again welcoming the tour with open arms. The tour would also like to thank golf course superintendent Mike Marsh and his staff for providing the tour with a beautifully manicured golf course. Next week on June 26-28 the Tarheel Tour travels to the Spring Creek Golf Club in Gordonsville, VA, for the inaugural Spring Creek Classic.